Go behind the scenes with the creators at TRIGGER! 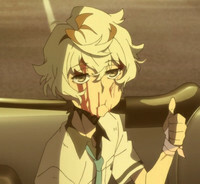 KIZNAIVER may have been over for a little while now, but it's never too late to check in and see what the creators had to say during its run. Thanks to our amazing translators we have a slew of PASH! articles and interviews for you to read, so start digging in now! Red top: PASH! Exclusive Information Revealed!! Bottom left: Only PASH! 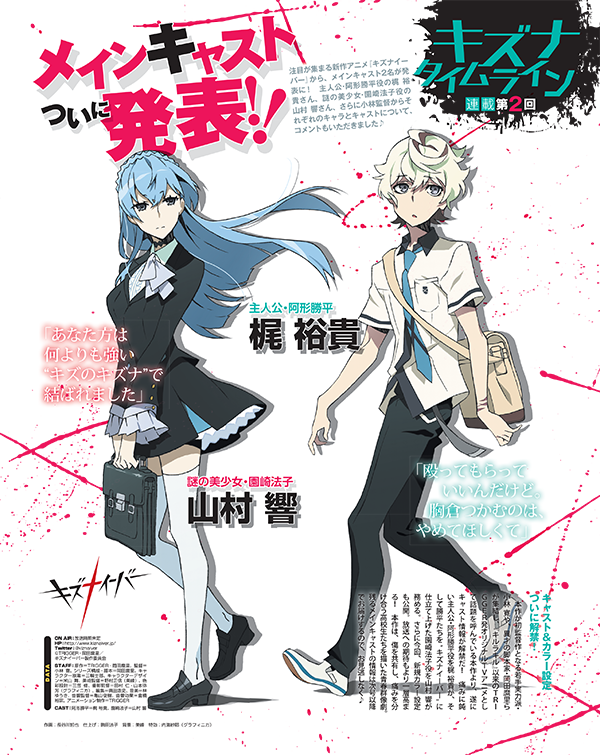 Was allowed to release details on the completely brand new original anime “KIZNAIVER.” What’s its full story...? We’ll give you plenty of the details you can only get here about the characters and story!! Top right: Character and Series Settings Revealed! 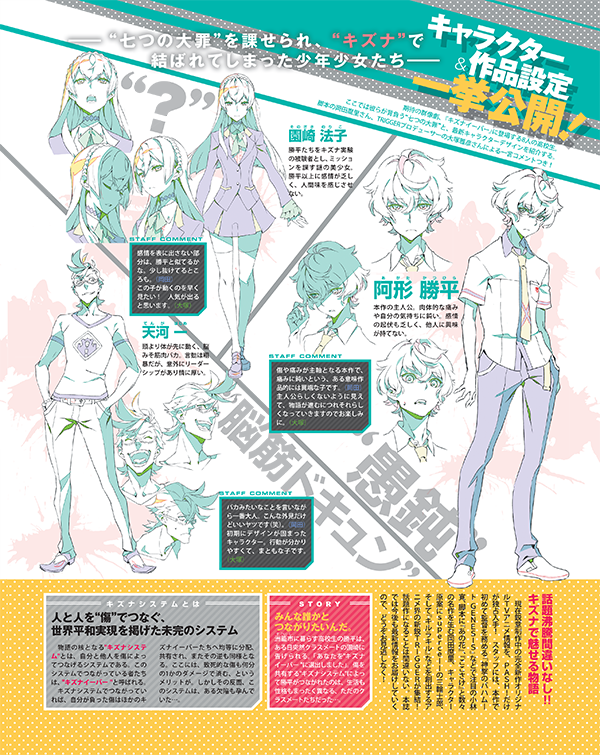 Tiny green under top right: The 8 high-school students that appear in the anticipated drama, “KIZNAIVER.” Here, we introduce the characters’ newest character designs, each of their “Seven Deadly Sins,” and a comment from the script writer Mari Okada, and TRIGGER produce, Masahiko Otsuka! Description: The protagonist of the story. He’s not very receptive when it comes to physical pain or his own feelings. He rarely shows emotions, and can’t seem to hold interest in others. Description: A mysterious young woman who chose Katsuhira and the others for the Kizna Experiment and gives them missions. She seems to lack emotions even more than Katsuhira, and seems to lack humanity. Description: An musclehead idiot that acts before he thinks. He says harsh things, but he surprisingly has leadership and cares deeply for others. Bottom right black: PASH! is the only one with the exclusive information about this brand new completely original anime that’s now in production! The staff include: Hiroshi Kobayashi, who makes his directorial debut with this series and is also known for “Rage of Bahamut GENESIS,” the script writer is Mari Okada, who gave the world “Anohana” and “Kokosake” and various other titles, for the original character design, we have supercell’s Shirow Miwa, and then we have the new anime legend, TRIGGER, who brought us “KILL la KILL!” There’s no doubt that this will be popular. We will continue bringing you the newest information in coming issues, so please don’t miss out! Everyone wants to be connected to someone. Description: A loner that is cool and calm. She has a very sharp tongue. She tends to act cold and uncaring about others. Description: A friend of Katsuhira from when they were little. Positively, she’s very good at taking care of others, negatively, she’s the class representative type that’s a bit meddling. Apparently her feelings toward Katsuhira are a bit complicated...? Description: She says she can see fairies. She is a very strange girl. Her fashion, as well as the way she talks is very unique. Description: He’s full of mysteries, and just by looking at his looks alone, anyone would say that he’s good looking. His many piercings and bandages give him a unique look. Description: He’s a hot honor student that always has girls around him and seems to have it made. He is selfish and calculating and is rather cold to other guys. Staff comment: He’s a hot guy. He tries to act cool, but seems to be losing still (lol). He’s a character that I like quite a bit. (Okada) He’s a great character. I think he’s very much human, and can’t completely become the bad guy. Bold white: The futuristic city built upon reclaimed land, Sugomori City. 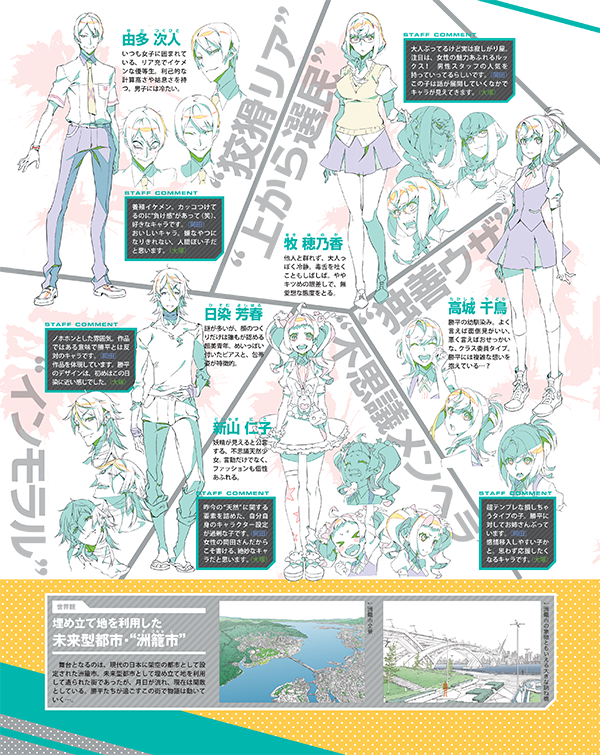 Big pink: What is “KIZNAIVER”? Small black: PASH! 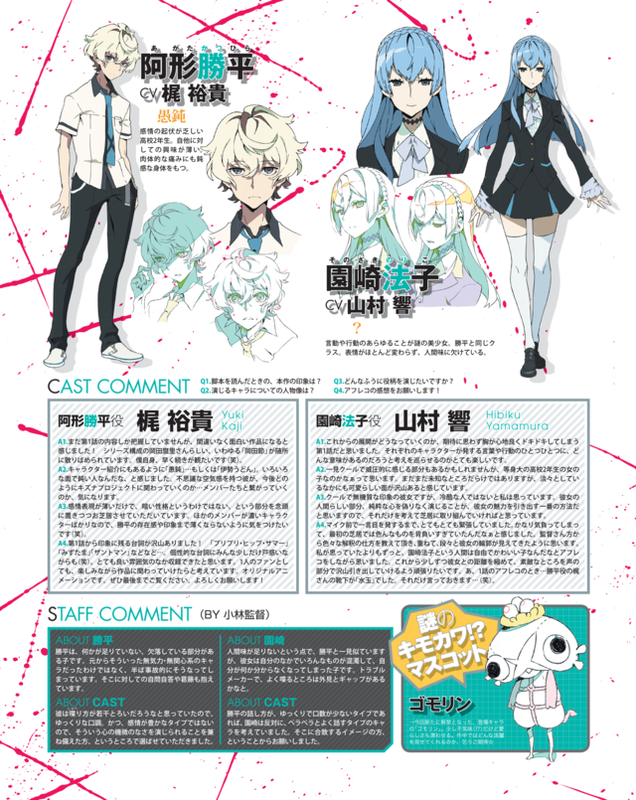 Is first to bring you the exclusive details on the brand new TV anime, “KIZNAIVER.” We asked the script writer, Okada, and TRIGGER producer Otsuka various questions concerning the project such as what brought on this project, what got their attention about the project, and what they want to express with this series. Pink: We wanted to show the bond, or Kizna, among boys and girls. Okada: Trigger’s Mr. Imaishi (Hiroyuki), (Director of “Gurren Lagann” and “KILL la KILL!”) and Ms. Tsutsumi were there, and it was very entertaining. There were no restrictions on genre and we just kept bringing up ideas. Wasn’t your idea a suicide squad, Otsuka-san? Okada: I was obsessed with Hell at the time (lol). We ended up decided we’d do that at another time. Otsuka: In the end, we decided on this project. It was about 3 years ago, wasn’t it? Aniplex wasn’t involved yet at the time, and we just decided to finalize the idea and take it somewhere. It’s actually rare to come up with a proposal like this and not have a production studio in mind. It had only been about a year since Trigger was established, so we wanted to go forward with Trigger. “KILL la KILL!” was still being prepared, so we still didn’t have an original anime to our name yet. But that didn’t make us lose heart, rather we were excited to build it up. Okada: There was also a special period in between, and we all got back together around the time “KILL la KILL!” went on air in 2014. Question: How was “KIZNAIVER” born? Okada: I thought in the last few years, “bond” was the keyword for the world. But I also thought that there were many ways of expressing bonds. Of course, you have your bonds with your family and friends, but I think you also feel a bond when you get over something hard with your coworkers. You can connect with others by sharing the same hardships and feelings. A bond exists there, too. I then thought I wanted to see a story where boys and girls were forced to share something like that. Otsuka: We had the title to begin with, didn’t we? Okada: I stuck the words, “kizuna,” or bond, and “naïve” together. This time, we had the title before the actual content. Around that time, there was a series called “Aoharide,” or “Blue Spring Ride,” and I thought the title was really cool (lol), and that’s where I got the idea of sticking words together. “Naïve” has a negative meaning in English, so then I thought “kizu,” or pain could be connected to “naïve.” And then the whole factor with “kizna(bond)” came in, and I thought that I could write about human relationships that would not be born usually with these settings. 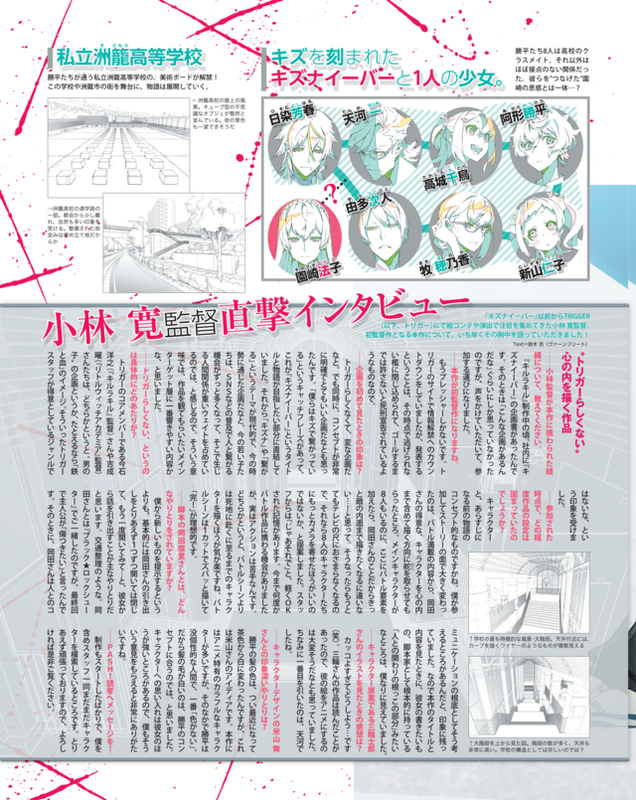 Question: Mr. Otsuka, what did you think when Ms. Okada told you the setting for “KIZNAIVER”? Otsuka: I thought about it with the title as well, but I thought it was very fitting with the anime nowadays. Trigger is pretty much run by a lot of old guy animators, so the ideas that we came up with made us question what period we were trying to write for (lol). So I thought that this was why anime nowadays was amazing, and it’d be an idea we’d never been able to come up with. Question: What is the theme of this series? Okada: Basically it comes down to if we’re really able to feel other people’s pain. Is it possible for us to feel about others like we feel for ourselves? I believe it’s a story about that communication. Though the way we express that is pretty wild (lol). Question: This is Hiroshi Kobayashi’s directorial debut, right? Otsuka: Yes. We always thought it would be best to have a young staff work on this. Mr. Kobayashi was in charge of the storyboards and was an episode director for “BRS” and “KILL la KILL!” so his reputation among us was great. I thought he’d be a great director someday, so this opportunity came up naturally. I thought he’d fit great with the taste of the series, so I offered him the job. Okada: Mr. Kobayashi is a sincere and serious person. I haven’t worked with many directors that are younger than me, but he’s very reliable. Otsuka: He’s very settled-down for his age. Okada: Right. Whenever he asks me questions, I feel like he’s definitely got experience in this industry (lol). Otsuka: He doesn’t randomly burst out laughing, nor does he get heated suddenly either. He’s always cool, but always takes the conversation deeper. Okada: Whenever he asks me questions, I can tell that he’s looked into the story quite a bit. He’s considerate of my thoughts. I like to think about various things, digest everything, and then find a path, so I find him to be very honest. Otsuka: When there are things he considers NG, he lets us know, but at the same time, he doesn’t try to get his way for everything. Question: How were Mr. Shirow Miwa and Ms. Mai Yoneyama chosen for original character design and character design? Otsuka: I brought up modern anime earlier, and because of that, I thought the person to do the original character designs shouldn’t be someone in our office. Thinking about projects done outside of our office, Mr. Miwa’s name came up rather quickly and naturally. When we saw the character designs he came up with, they were done in a taste that hadn’t been done before and were very fresh. Okada: Mr. Miwa has his own very unique atmosphere. Otsuka: And when we were setting up the setting diagrams for the anime, Yoneyama’s name came to mind out of the current young artists. I thought she fit the taste of the project, and she’s one of the best of this generation. Question: We think that this project is new territory for Trigger. Are you enthusiastic about it? Otsuka: Well, it is only our second original TV anime series after “KILL la KILL.” Doing a project centered on our younger staff working on it after there being a lot of expectations from us because of our last series I think brings on a lot of pressure. I’d like to let them take care of the things that I believe they can handle, so I’d like to just cheer them on. However, there are members that will just keep pushing through once they’ve gotten started, so I become conflicted with letting them do what they want, but also having to hold them back. Animation does have a budget and a schedule, so... (lol). Question: Trigger series are known for their characters that move quite a bit as well as their intense battle scenes, but will there be any battle scenes in this project? Otsuka: If we had to choose how to describe this series, I’d say it’s more about human relationships and the characters’ emotions. Okada: At first, we were considering having some battle scenes, too. Because they are sharing their pain among others, even if they are damaged, they can still fight. But because they are all sharing their pain equally, in the end if they all got hurt too much, they would all die at once. So after talking with the director and everyone else, we decided to express the emotional side of things. Otsuka: We thought that a story about daily life would be very important. In certain ways, animating daily life is harder than animating action like in “KILL la KILL.” The series might lack flashiness, but concerning how the characters move, I think that the staff will be able to bring out their best. Question: How will you be expressing the fact that this is a Trigger project with this series? Otsuka: I’m not sure if this will make it seem like it’s a Trigger series, but I believe that a series starts with the director and its staff. So I they’re able to bring themselves out in the series, I believe that equals the series being Trigger-like. I believe in my staff, so I know that whatever they make will also be amazing. They’ve only started the key animation so far, but I’m looking forward to seeing the final product. 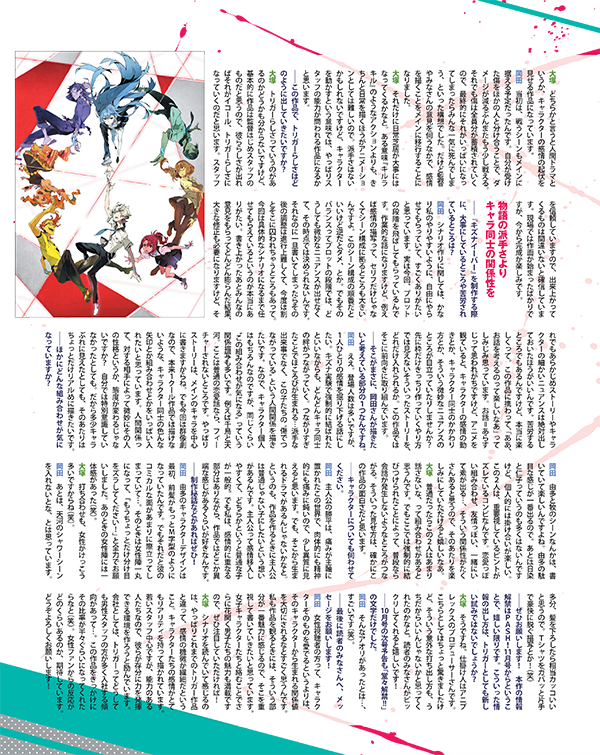 Question: While producing “KIZNAIVER,” what are you keeping important and what hardships are you facing? Okada: In regards to the scenario writing, I’m very thankful because they allowed me a lot of freedom and to do things how I like to do them. On this project, they’re actually letting me skip the plot phase right now. This is going to get a little technical, but when you’re trying to draw out emotions, it’s not just about the dialogue, but also how the scene is composed. Like figuring out what order the scenes should be composed. But in the plot phase, it’s really hard to bring out those subtle nuances and I can’t make decisions in that phase. Yet once you write something, it becomes a lot harder to fix it later on, but this time, I didn’t really have to worry about that. I was very thankful that they actually left everything to me until the actual scenario was written. After getting everyone’s feedback on what I had finished, there will need to be revisions, but it’s best to have the minor nuances in the story and characters come out at that point. It’s definitely rough, but it’s a lot of fun. Working on this project, I’ve been reminded how fun it is to think up stories. I’m sure people think that stories = summaries, but when you watch anime, don’t subtle nuances such as how a character’s emotions move or how characters interact with each other catch your attention more? With this story, I want to see how much of a story I can come up with without having established frames to fill in later. Question: So that must have been one of the things that you wanted to write, Okada-san. Okada: Yes. There are a lot of characters, but I want to make sure that I dig down deep into everyone’s emotions. Regardless of them being forcibly connected through the Kizna System, the characters’ bonds will deepen on its own. Because they connect too much, a tear will happen. I don’t want this to be flashy, but rather I want to show the story of the relationship between these kids who have been connected through their wounds. Of course, that means bringing out each character individually, but I’d also like to look into the various pairings among the characters. For example, Chidori and Tenga. If this was a normal love story, they wouldn’t be featured. The story is still written around the main character. But because this is a dramatic story, I’d like to include character pairings and other such things you wouldn’t normally be able to include in just a single cour anime. When you’re talking about relationships, depending on who you’re dealing with, your attitude and how you interact with that person change a bit, right? Even if you didn’t really realize that... So even if it looks like the characters aren’t as complete, that is an aspect that I’d like to write very realistically. Question: What other pairings are you thinking about? Okada: It’s a lot of fun writing the scenes with Yuta and Maki. That’s when you see Yuta fail the most. Also, though there isn’t a lot of Hisomu and Nico, I personally have a lot of fun putting those two together. This combination is a bit off. Love pairings, friend pairings, pairings where they can be themselves in front of the other... I think there will be a lot of possibilities for those. So it would make me happy if people would look forward to all of that. Otsuka: I think there will be pairings where in usual situations, the two characters wouldn’t even speak to each other. But because they are forcibly being connected, even though they wouldn’t have usually talked to each other, they’re able to connect with each other. I believe that’ll be one of the most entertaining parts of this series. Question: Could we inquire more about the characters? Okada: In this world filled with pain, the protagonist, Katsuhira’s ability to feel both physical and emotional pain is dumbed down, so I think he’ll stand out. But I think there will be drama born from there. When I was writing series, I want to make the protagonist not be normal. Usually, the protagonist is relatable and usually pretty normal. But because this story has a lot to do about emotions, I wanted things to be a little off. Question: Please tell us any secrets behind the production! Okada: In the beginning, Yuta’s bangs were in the shape of an “M.” But that made him seem way more comical than he was initially supposed to appear. But then all of the girls working on this got together and requested that his bangs be a bit more off to one side. All of the girls felt like they were one at that point (lol). Otsuka: Even in our meetings, we did have a lot of women present (lol). Okada: Also, I thought about putting in a shower scene with Tenga. I thought he might look pretty hot with his hair down. Or like imagining him take off his T-shirt with one hand (lol). Question: Thank you for letting us break this information in the November Issue of PASH! Is there anything new that TRIGGER is trying with releasing information about this series? Otsuka: Well, the instigator is the producer at Aniplex. We were a bit surprised, but we thought that this way of revealing information fit how we do things. It’ll be great if all of the readers are surprised by this. Question: In the October issue, we just had the words “Boldy Revealing!” in the next issue preview. Okada: I didn’t know you guys were being so instigating (lol). Question: Lastly, could you give a message out to all of our readers? Okada: I think that female fans will treasure the relationships that come out of this series rather than the characters themselves. When I watch series, I find that part to be the most appealing, as well, so I’d like to concentrate on that in my writing. The girl characters will make the boys’s potential blossom in this series, so please look out for that! Otsuka: When you read the scenario, you can tell that this is unlike other Trigger series and concentrates a great deal on emotions. The emotions of the characters are reflected in a very realistic way. Even though our staff is young, they are all very qualified, so I try to make an environment where they can do their best. Trigger always seems to have a lot more male applicants who enter the company... I’m hoping that this project might be able to change that (lol). I’m looking forward to seeing how much feedback we get from the female fans. Please look forward to this project! PASH! Brings You the Latest Info!! 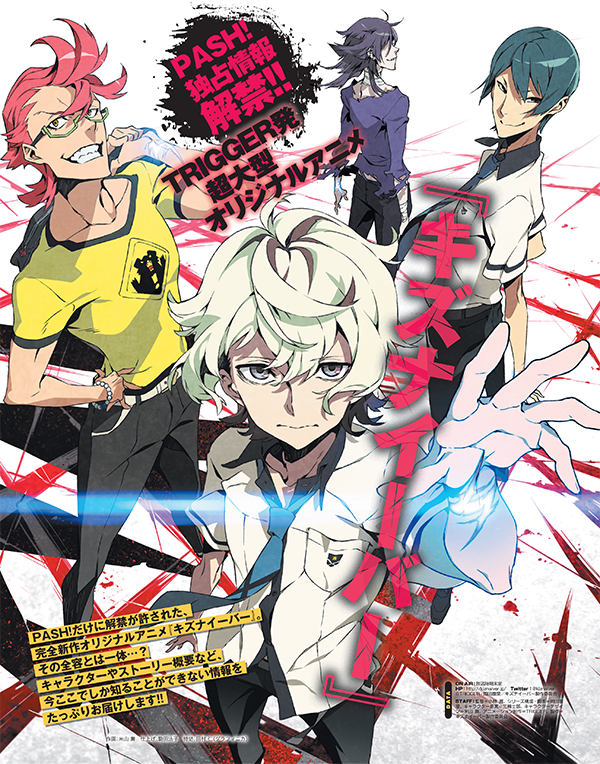 TRIGGER’s original anime, “KIZNAIVER,” became a hot topic the moment the earliest information on the series was revealed. This issue reveals the design of the scar carried by all the Kiznaivers, as well as the artistic setting, before any other source! Also featured is a solo interview with the director, Hiroshi Kobayashi. The main character, and a second-year in high school. He is essentially numb to his own pain, both physical and emotional, and is unable to display any interest in other people. He is sorely lacking in emotion and personality. ↑The fully detailed design of the mark engraved on the arms of the Kiznaivers. Shows three horizontal and two vertical lines. It also looks a bit like キ, the first character in the words “kizuna (bond)” and “kizu (wound),” doesn’t it...? One day, Katsuhira and six of his schoolmates are suddenly put through surgery and told by Sonozaki that they’ve been forcefully turned into “Kiznaivers,” people who share one another’s pain. The scars left near Katsuhira’s left wrist appear as an elongated design wrapping around his arm. That scar is the mark of a Kiznaiver. The art board for Sugomori Private High School, the school attended by Katsuhira and the other Kiznaivers, is revealed! The anime’s story unfolds in this school and the surrounding city of Sugomori. ←The Sugomori High School rooftop. Strange cube-shaped objects are arranged in neat lines. It appears to have an uninterrupted view of the city as well. →Part of the route to Sugomori High School. Set apart from the big city a bit, it seems to have lots of natural scenery. Perhaps because the city was built on reclaimed land? The Kiznaivers, marked with a scar, and one girl. Katsuhira and the other seven characters are classmates, but otherwise, they share very little connection at all. What are the intentions of Sonozaki, the girl who “connected” them...? Director Hiroshi Kobayashi has drawn attention for his storyboard and production work with TRIGGER long before “Kiznaiver.” We had him share his thoughts on this series, his first directorial work, with us before anyone else! —Can you tell us how you became involved with this series? While I was working on “Kill la Kill,” I came across a proposal for a series called “Kiznaiver” in the office. At the time, I didn’t think any more of it than “Oh, there’s a proposal for a show like this?” But then I was approached about it and ended up joining the staff. —This is your first time directing a series. And the pressure is intense! There was a countdown leading up to the reveal of information on the TRIGGER website, but from the moment it was decided that the series would be announced, it felt like I was trapped in a jail cell on death row and wouldn’t be let out until I reached the finish line. —What did you think when you first saw the proposal? I thought it was a strange proposal, and one unlike typical TRIGGER. But at the same time, I thought it was a great proposal with an exceptionally clear concept. 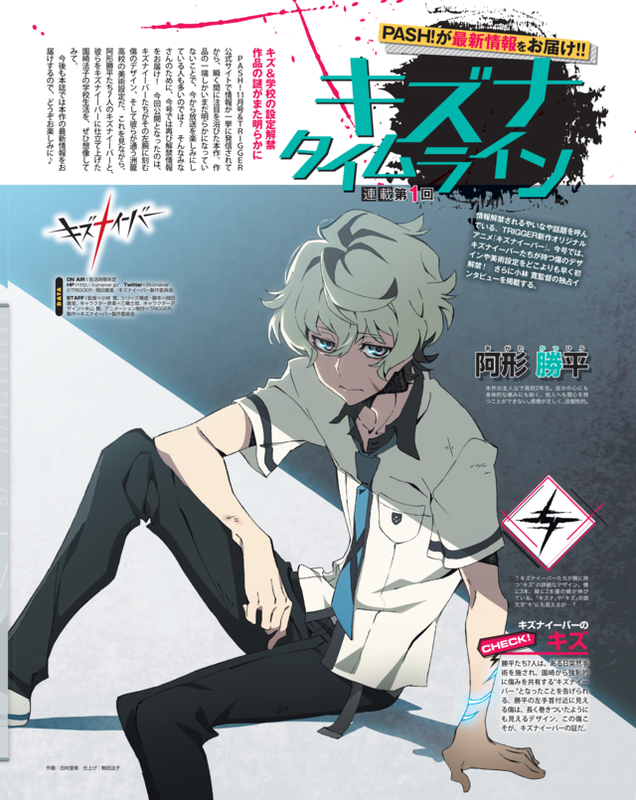 It had the catch phrase “We are bound by our wounds,” which directly connected to the title, “Kiznaiver,” and the story it intended to tell. Also, the themes of “wounds” and being “connected” seemed very modern, so it seemed in line with the day and age we live in. Young people these days have far more opportunities to connect with others thanks to the popularization of SNS, and I feel like the relationships born from that carry a lot of weight. In that sense, I think this is the sort of story that will resonate most readily with our main target audience. —Can you tell us in detail why you consider it a work “unlike typical TRIGGER”? Some of the core members of TRIGGER, like Hiroyuki Imaishi-san (Kill la Kill director) and Yoh Yoshinari-san (Little Witch Academia director), have the image of working on more “boyish” projects, the type that sort of give an impression of “iron and blood.” My impression was that this work didn’t seem to fit the genre that TRIGGER’s staff tends to excel in. —How much of the project was finalized by the time you joined the staff? The characters, and the general concept of the story before it became a series synopsis, I think. The biggest change to the story after I joined the staff was to turn it from a battle-heavy work into one that depicts what’s in the characters’ hearts, the sort of thing Okada-san specializes in. Even though there are already eight main characters to flesh out, I knew that adding a lot of battle elements would make Okada-san want to flesh out the inner hearts of the enemies, too! And if that happened, it would exceed the scope of a TV show, so I suggested that it might be better to keep the focus on those eight main characters instead. I remember the staff very easily agreed to that. I’ve been involved with a few battle-centered series before, but truthfully, action is not my strong suit. I have an easier time depicting the time leading up to a character’s final resting place than depicting battle scenes. I consider it ideal to get battle scenes taken care of in one cut and be done with it. —What sort of discussions did you have with the writer, Mari Okada-san? —What did you think when you saw Shirow Miwa-san’s original character designs? I thought, “What am I gonna do? These look too amazing...” (laughs) I’ve read Miwa-san’s works, so I’ve always thought his art would be difficult to reproduce in anime form. By the way, the one that caught my eye the most was his drawing of Tenga. —What have you discussed with the character designer Mai Yoneyama-san that left an impression on you? Katsuhira’s hair color just recently changed from brown to white. This was Yoneyama-san’s idea. The series has plenty of the sort of colorful characters that are unique to anime, but among them, Katsuhira is the most impersonal and “colorless.” So we thought white hair would fit Katsuhira’s concept. She tends to have a stronger attachment to the characters than I do, so I really appreciate it when she offers opinions like that to me. —Finally, a message for the readers of PASH! Production has only just begun, so I and the rest of the staff are still fumbling around with the characters. But we are giving it our best, so I hope you’ll all watch the series. ↑The most unique-looking part of the school: the big staircase. We can see several of what appear to be wires forming curves along the ceiling. ↑The view from the top of the big staircase. There are a lot of stairs and the ceiling is extremely high. Probably quite unusual for a school layout? The Main Cast Is Announced At Last!! The cast and color schemes are revealed at last! A high school second-year who scarcely experiences any emotional highs or lows. Disinterested in both himself and others. His body is also numb to physical pain. Everything she says and does is enigmatic. A classmate of Katsuhira’s. Her expression rarely changes at all and she is quite impersonal. Q1: What was your impression of the series after reading the script? Q2: How do you envision your character? Q3: How do you hope to portray your character? Q4: Tell us about the after-recording! A1. I don’t know anything about it beyond the first episode, but I felt that this would no doubt become an interesting title! Elements typical of the series composer Mari Okada, which we call “Okada notes,” are scattered throughout the entire work. I’m excited to see more of it myself (laughs). A2. As his profile says, he is an “imbecile (gudon)”... or perhaps “Ise udon.” I felt like he was very dull in various ways. I’m curious to see how a guy with such a strange atmosphere about him will become involved with the Kizna Project... and how he’ll connect with the other members. A3. I try to portray him in a way that makes it clear that he doesn’t particularly have a gloomy personality; he’s just very weak when it comes to emotional expression. All the other characters are very strongly expressive, so I want to be careful not to let Katsuhira’s presence or the impression he gives grow any weaker (laughs). A4. There were lots of lines in the first episode that left an impression on me! Like “Jiggly jiggly hip summer,” “polka dots,” “Sandman,” and on and on... Even though everyone was a little bewildered by the highly individualistic lines (laughs), I think the atmosphere was good as we completed the recording. As a fan myself, I’m personally looking forward to becoming more deeply involved with this work. It is an original animation. Please watch it through the end. Thank you very much! A1. I felt like it was a first episode that made me feel anxious in a pleasant way to see how the story would develop. I have a lot of fun trying to figure out what sorts of meanings lie behind all the things that each character says and does. A2. She might seem cool and intimidating at first glance, but I think she is a genuine high school second-year student. A lot about her is still unknown, but in the midst of her indifference, I think there are lots of cute things about her. A3. She may be cool and even robotic, but I don’t think she’s a cold-hearted person. I think the best way to bring out her charm is to faithfully act out her human side and her pure heart, so I’m hoping to just focus on that as I portray her character. A4. I was really, really nervous right up to the moment I spoke my first word into the mic. I got so worked up, I think I took on too much in my first scenes. After the director and other staff showed me various ways to interpret things numerous times, I feel like I’ve gradually begun to see the outlines of her character. As I went through the after-recording, I felt as if this Sonozaki Noriko person was much more free-spirited and cute than I had thought. I hope to do the best I can to slowly close the distance between myself and her, and to bring out her wonderful qualities through her voice. Oh, and while recording for the first episode... Katsuhira’s voice actor, Kaji-kun, had polka dot socks on. That’s all I’ll say about that... (laughs). Katsuhira is a boy who’s missing something, who’s lacking in some way. But he wasn’t a lethargic, apathetic character to begin with; he turned out that way almost by accident. I carry a lot of self-questioning and conflict within myself about that. I thought of the character’s speech style as being a bit dull, so I wanted someone who spoke slowly. Also, he isn’t a very expressive character, so I made my choice for someone who could also reflect that lack of sensitivity. She seems similar to Katsuhira at a glance, since she has a very impersonal side, but she really just has so much chaos and uncertainty swirling within her that she’s not sure what she is anymore. I think her troublemaking side and her tendency to talk a lot create a strong contrast to her appearance. Katsuhira speaks slowly and infrequently, so in contrast, I thought Sonozaki should be a character who talked a lot. I asked this actor to play the role because I felt her own image was in agreement with that.